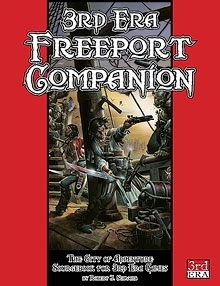 The 3rd Era Freeport Companion is a rules supplement for the Pirate's Guide to Freeport. Its 160 pages are packed with all the support you need to run a 3rd Era Freeport campaign. In addition to giving game stats for all the major characters, the 3rd Era Freeport Companion provides new core and prestige classes, famous magic items, an insanity system, new spells and incantations, and an introductory adventure. This title was added to our catalog on February 05, 2008.